The parade celebrating "Pride in the Park" at Dolores Park in San Francisco, California on June 22nd, 2012. A lawsuit is being filed against the city of San Francisco Beautiful, charging that the city is allowing illegal signs to proliferate because they are too anxious to settle suits by the sign companies on May 17th, 2012 in San Francisco, California. 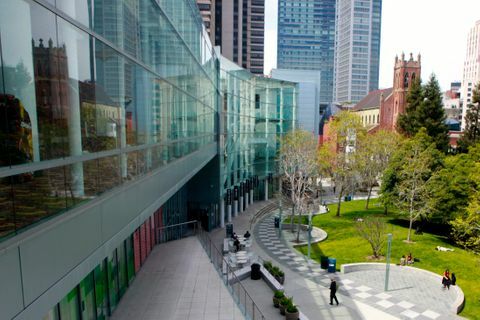 The Metreon overlooks Yerba Buena Gardens. The street where Chris Bucchere was riding his bicycle down when he ran over 71-year-old pedestrian Sutchi Hui who was crossing Castro, at Market street. Sutchi Hui, died. In San Francisco, California on April 7, 2012. Beer and food served at Ol Beercafe & Bottleshop on Saturday, June 9th, 2012 in Walnut Creek, California. Food served at Darwin Cafe in San Francisco, California. Artwork for sale as part of the Oakland Art Murmur that takes place on the first Friday of every month in Oakland, California. From the garden of Eric Woodhouse featured on the Bay Friendly garden tour, in Mill Valley, California, on Thursday, April 26th, 2012. Abelardo Morell, came out from Boston to demonstrate his portable camera obscura in a tent, which he will later set up inside the brick barracks during the International Orange exhibition that will take over Fort Point National Historic Site as part of the 75th anniversary celebration of the Golden Gate Bridge. This demonstration took place in San Francisco, California on Friday, April 13, 2012. Inside of the new home furnishing store Cavalier, in San Francisco, California on April 17, 2012. Builder, James Bringman works on a bike at Mission Bicycle Company which specializes in fixed gear bikes in San Francisco, California., on May 1st , 2012. Owen Smith, BART poster artist, sketches in his studio on May 24th, 2012 in Alameda, California. Michael Mickey Ganitch, 92, shakes hands with a local man who gave him a sextant after Ganitch's original sextant, which he used during World War II , was stolen. Kaiser Permanente medical centers in Northern California observe National Nurse's Week. Fr Kevin Kennedy performs a ritual "blessing of the hands" in the laboratory to nurse Divina Mamuyac, Terri Epidendio, and daughter and patient Isabella Epidendio in Redwood City, California on May 9th, 2012. Ellie Mowry- Silverman, age 5, practices ballet in Sausalito, California on April 18th, 2012. Karyn Barsa, CEO of Berkeley's Coyuchi, sits on their 'test bed' in their office displaying linens, in Berkeley, California on April 11, 2012. John K. Stewart, Chairman of The John Stewart Company, who heads the coalition, is a key speaker at the rally at City Hall on Tax day, in San Francisco, California on April 17, 2012. Corey Chan, who has been teaching Dragon Dancing since 1998, leads a community class at a basketball court in San Francisco, California on April 4, 2012. Practicing for the feature/review of Luna Dance Institute in Emeryville, California , on April 25th, 2012. Swing/Lindi hop class at the Savanna Jazz Club on May 23rd, 2012 in San Francisco, California. Satriani and Hagar take the stage of the Regency Center with two surviving members of the band Montrose, bassist Bill Church (second from left) and drummer Denny Carmassi. The students of Downer Elementary school have traded in their cardboard instruments for their brand new violins and cellos donated by the California Symphony on May 25th, 2012 in San Pablo, California. Santacon in San Francisco, California. A couple walks along the Batteries to Bluffs trail in San Francisco, California. A couple holds hands at the Trans March at SF Pride in Dolores Park, 2012. Michael Purdy and Jay Jeffers inside of the new home furnishing store Cavalier, in San Francisco, California on April 17, 2012. Celebrating Queen's Day near the Dutch Windmill in Golden Gate Park in San Francisco, California , on April 28th, 2012. Gennadi Nedvigin and Dana Genshaft perform at the dress rehearsal of Program 7 for the San Francisco Ballet at the War Memorial Opera House in San Francisco, California on April 12, 2012.